USA, 1862, 5c red brown. Waffle grid cancel, rich fiery red color, exceptional centering, Very Fine to Extremely Fine, with 1986 P.F. certificate and 2004 P.S.E. Graded certificate (VF-XF 85, SMQ $750). Scott No. 75; $500. 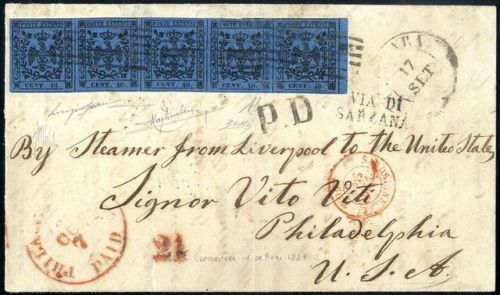 United States, Letter cover from 1937, Around the World on FAM 14 & 10, franked with U.S., Hong Kong (Sc. 145) and Brazil stamps, send air registered express with appropriate labels and fully back stamped, an exhibition piece, Very Fine. Estimate $400 – 600. 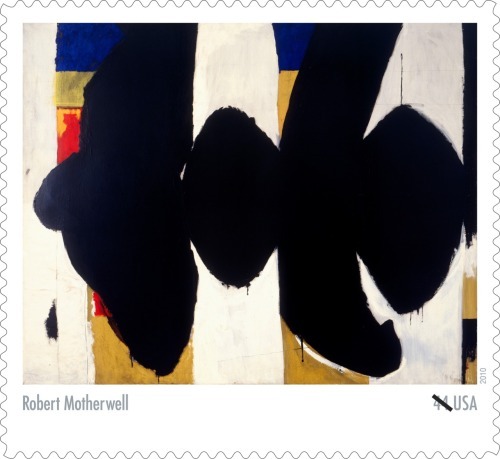 Born on January 24, 1915, abstract expressionist Robert Motherwell viewed literature and philosophy as integral components of his art. He is best known for the “Elegy to the Spanish Republic” series, an ambitious group of somber abstract paintings. This stamp was issued in 2010 as part of the Abstract Expressionists pane.